A woman milking a cow into a gourd vessel in a rain-sodden cattle pen, corresponding with the May-July fieldwork Evans-Pritchard carried out in 1935. Men were forbidden from milking unless no women or children were available, such as on a journey and the task was one of the most important of female household tasks. Note on print reverse ms pencil - "43 4 A91" & print front border ms ink - "NUER VIII/60"
Morton, Chris. 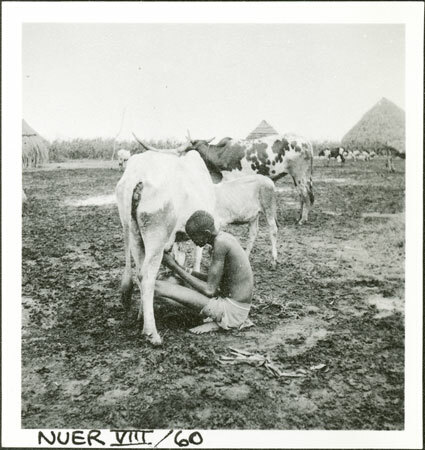 "Nuer woman milking" Southern Sudan Project (in development). 03 Jan. 2006. Pitt Rivers Museum. <http://southernsudan.prm.ox.ac.uk/details/1998.355.377.2/>.